Shelled acorns. Most are good but some have bad spots that need to be cut out. The acorns are ripe! They look a bit smaller than usual to me this year. Maybe the dry, hot weather? Check them over carefully to get good ones. So how do you get the good ones? You are looking for nuts that aren’t super bitter, don’t have a lot of worm holes in them and are a light color without cracks. You can also float them in water and the good ones should sink. Do be absolutely sure that the tree has not been sprayed with any pesticides. Oaks can be sprayed with long acting chemicals to reduce aphids; when in doubt ask! 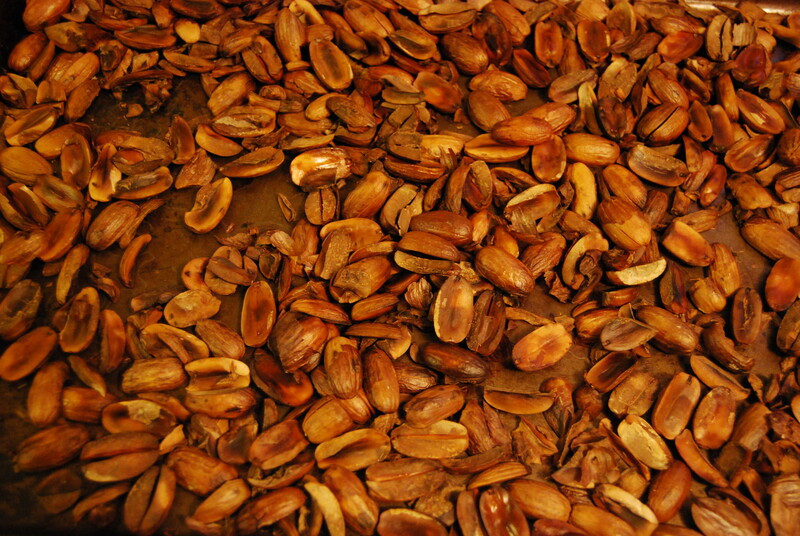 What makes acorns bitter is tannic acid and some varieties have more than others. If you want to use the acorns as a mordant for wool or for dying then the really bitter ones are perfect. If you are looking to eat them then taste test until you find a milder variety. 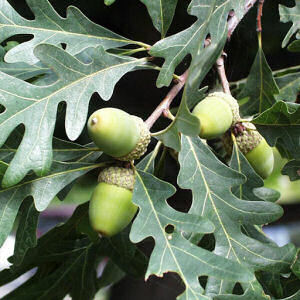 In the white oak family, the Live Oak’s, (Quercus virginiana), acorns are among the mildest one can collect. Pick the acorns when they are brown. Acorns are quite nutritious. The nutritional breakdown of acorns is 50.4% carbohydrates, 34.7% water, 4.7% fat, 4.4.% protein, 4.2% fiber, 1.6% ash. A pound of shelled acorns provide 1,265 calories, a 100 grams (3.5 ounces) has 500 calories and 30 grams of oil. The first part of processing is shelling. Wear gloves to avoid staining your hands. It can be a bit of a task to get the shells off but letting them dry a bit or freezing them first can help to loosen the covering. 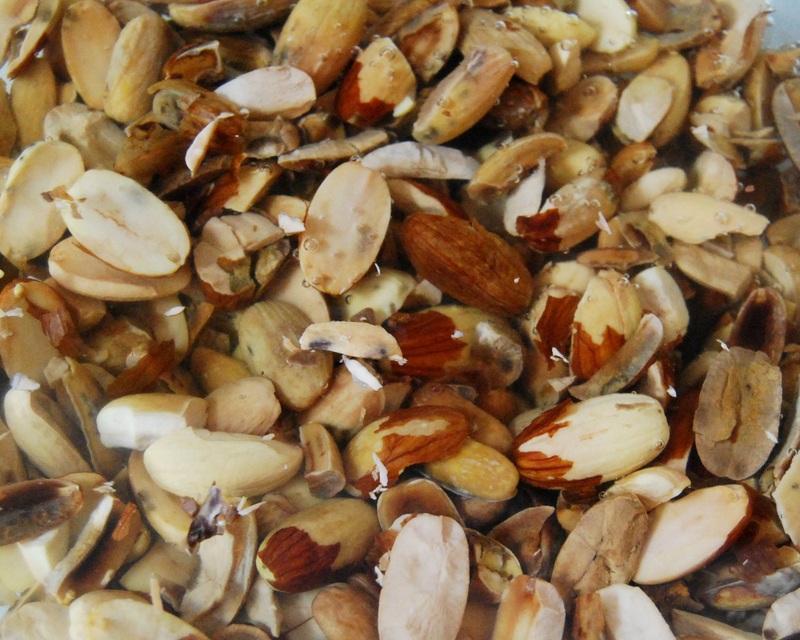 To rid the acorns of tannic acid Native Americans would put them in baskets in streams. My version is to put them in a pillow case in the top part of the toilet tank. It sounds gross but the water in the tank is clean. It can stain the bowl a bit but hey, it’s the only running water I have. After a week in the tank you can put them in a 350 degree oven and roast them for an hour. Once they are dried out I grind them to flour in a food processor then ziplock them and put them in the freezer to be added to foods later. Mix together and fry on a greased griddle until done. Place beef in heavy pan and add water to cover. Cover with lid and simmer until very tender. Return meat to the liquid. Stir in the acorn meal. Heat until thickened and serve. If you find a good recipe please share!